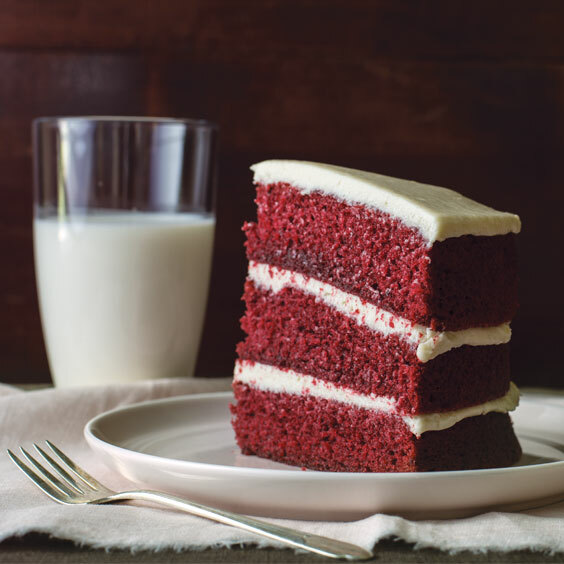 Classic Southern red velvet cake comes in all shapes and sizes, all across the country. Among all the ways to enjoy red velvet cake, Cake Monkey Bakery’s version truly stands out. The bakery specializes in miniature layer cakes and upscale versions of favorite childhood treats, and they offer red velvet options of both. Their mini red velvet layer cake features a raspberry vanilla buttercream frosting that is naturally tinted pink from the fruit. They also created a Cakewich, which is a red velvet cake sandwich filled with their raspberry vanilla frosting and coated in a rich bittersweet chocolate. Their fun and tasty treats can be found at their bakery or ordered online to be shipped nationwide. 7807 Beverly Blvd. Fourth-generation baker and bakery owner Dan Matoski and his wife opened Red Velvet Cakes & Pastries in 2012 at a time when there was no bakery in their family, which just didn’t feel right to them. The bakeshop sells an extensive list of goodies in many flavors, and their well-loved red velvet options include cupcakes, layer cakes, tortes, sheet cakes, cookies, brownies, and even wedding cakes. Dan says red velvet is one of the most common selections for the top tier of wedding cakes. He says particular brands of vinegar, cocoa powder, sour cream, and buttermilk make his red velvet so special, and the homemade buttercream cream cheese frosting takes it to the next level. 42948 Hayes Rd. 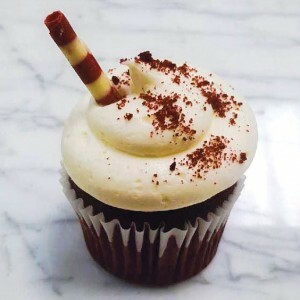 When The Flying Cupcake bakery opened in fall 2007, their Red Velvet Elvis Cupcake was a rotating flavor on their menu, and by Christmastime, the unique, chocolaty treat was in high demand. 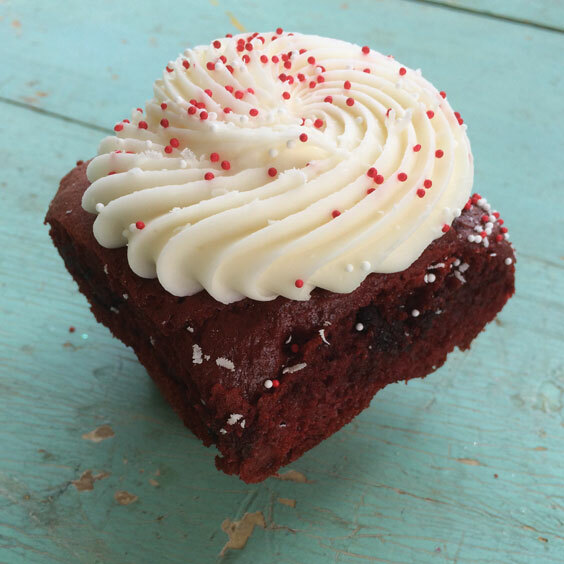 This red velvet creation features a soft, light cake bottom with a dense, brownie-like top that’s filled with melty chocolate chunks and topped with a cream cheese and white chocolate icing. At least one million of these cupcakes have been sold, and the treat is now available year-round at all the bakery’s locations and from their cupcake truck. 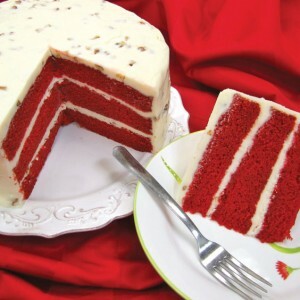 Want just a bite or two of classic red velvet cake? Pastry Art has got you covered. Since 2006, this store has been creating three-bite mini cakes known as Baby Bites®, and red velvet is their most popular. It’s the same recipe as their traditional red velvet layer cake, but you can enjoy it on the go or to satisfy your red velvet craving. Made on site, these small bites pack in the rich flavor and moist texture you want in your red velvet cake, with homemade cream cheese frosting, of course. Litton’s is known for its mouthwatering hamburgers and hand-cut fries, but their three-layer red velvet cake is a long-time favorite among customers. Litton’s swears by using the very best ingredients for their red velvet recipe, and this family-owned restaurant strives to create baked goods just “like your grandmother used to make them.” Order by the slice while eating in the restaurant or online to have shipped anywhere in the US. 2803 Essary Rd. Although this nationwide bakery really does sell nothing but Bundt cakes, they have plenty of fun and delicious options. Their cakes come in nine flavors and a wide variety of sizes, including 8- and 10-inch cakes, mini Bundts, bite-sized Bundts sold by the dozen, and tiered Bundt cake towers. 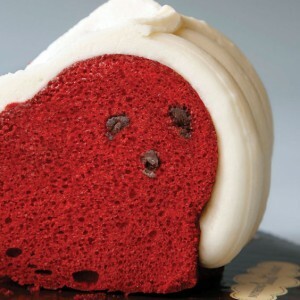 Their popular red velvet Bundt has milk chocolate hand-swirled into the batter, semisweet chocolate morsels sprinkled throughout, and a hearty drizzle of their signature cream cheese icing. With moist, rich creations like their red velvet cake, it’s no wonder Nothing Bundt Cakes, started by lifelong friends almost 20 years, has grown into a beloved bakeshop with more than 170 locations. Looking for a fun variation on the red velvet tradition? 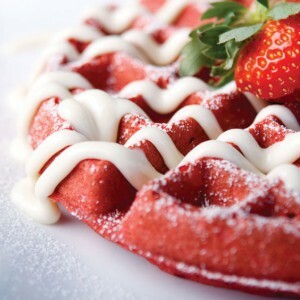 Try the Red Velvet Waffles at Terrace Café, which serves “Southern cuisine with a twist.” Terrace promises the same rich chocolaty flavor of red velvet cake in their waffle, and they even top it with a cream cheese drizzle. You can add fried chicken to the red velvet waffles for a delicious sweet-and-savory creation. 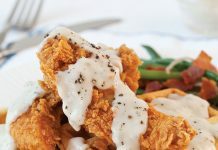 Owner Brandon Byrd loves to combine the old-fashioned flair of classic Americana with the delicious flavors of Southern cuisine. As a result, he created the Big Red Donutwich—frozen custard sandwiched between red velvet doughnuts. Most of the year, the treat is available from Brandon’s retro food truck, but come wintertime, you’ll find these creations in his restaurant. 1400 Independence Ave SW.
Sugaree’s Bakery celebrates baking in the Deep South with their heritage-based menu. 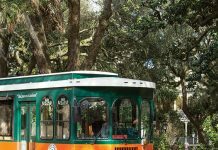 Their scratch-made cakes, including caramel, coconut, strawberry, and red velvet, taste like they could be found on any Southern sideboard. Owner Mary Jennifer Russell says they serve their red velvet cake the way it was originally made, with a cooked milk-and-flour icing that is spread between the layers and on top only. 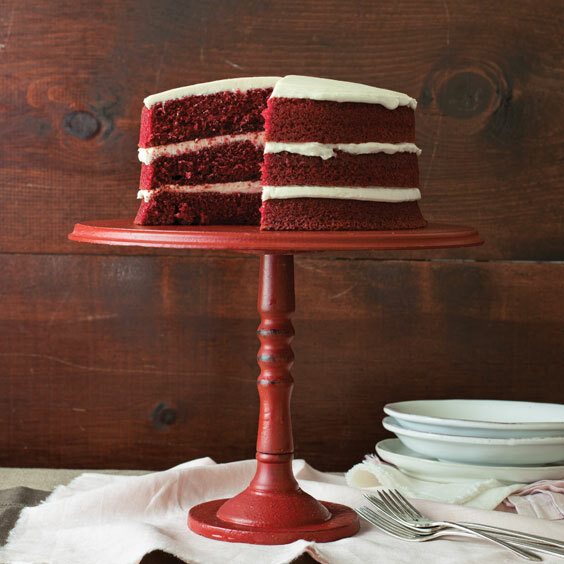 She explains that red velvet cake originated during a time of rations on common baking ingredients and that this cake—containing less cocoa, sugar, and icing—was inexpensive to make. Today you can get Sugaree’s red velvet as a three-layer cake, a cupcake, or order it online to enjoy any time you crave this traditional treat. 110 West Bankhead St. 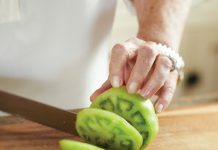 When Johnnie Gabriel, Paula Deen’s cousin, started baking cakes in the late 1980s, she was only looking to make a little extra money on the side. Little did she know, her homemade cakes and pastries would explode in popularity. Gabriel’s has locations in Marietta, Acworth, and Hartsfield-Jackson International Airport, and customers can’t get enough of their red velvet cake. Dense and velvety in texture, Johnnie says this dessert truly melts on the tongue, but for a little crunch she adds toasted pecans to her signature cream cheese frosting.